In 1773 the Boston Tea Party had a larger impact than just a political movement and regardless of your current policitical stance, the Boston Tea Party stands out as a momentous time of change. History students learn of the significant (though strikingly orderly) rebellion and spark of the Revolutionary War as the Boston Tea Party. Patriots, specifically the Sons of Liberty dressed as Indians to protect their identities, boarded three ships and dumped tons of tea (342 crates to be exact) into the Boston Harbor. Unfortunately, many Americans don’t comprehend the sacrifice the colonists made to refuse England’s shipment of tea because they do not drink tea. Perhaps if it was labeled the Boston Coffee Party, Americans might understand the choice the colonists made. During this period of American History, thanks to John Hancock organizing a tea boycott, tea sales in the colonies from the British East India Company dropped from 320,000 pounds to 520 pounds. It can be argued since this time, Americans’ relationship with tea has never been the same. The Boston Tea Party caused us to forget the comfort, serenity, and health the tea leaf provides. 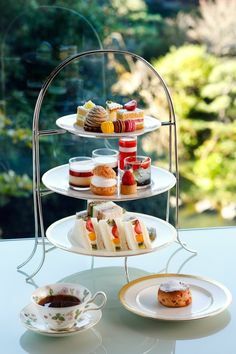 However, tea sales have increased four-fold since a decade ago according to the Tea Association of the USA, as more and more experience freshly brewed loose-leaf tea. I fell in love with the true brew in December 2004 the first time I visited a tea room and drank tea made from correctly brewed loose leaf tea. Since that time, my tea-drinking habit includes three pots made daily, the afternoon one often including friends and “a little touch of something”. Tea holds the place of the second most drunk beverage in the world, second only to water. The Chinese discovered it and kept it secret for 3000 years, England fought wars to get it and Japan built their world famous gardens around it. This is not the tea of the tea bag, but the tea leaf with as many intricacies as fine wine. Yes, the Boston Tea Party changed the political world forever but it also changed many a tea drinking habit. Now that the Boston Tea Party is back in vogue and a whole new group of Patriots are decrying taxes, why not take the time to visit the little leaf that started it all? Pour yourself a cup of tea and thank God you are an American and you can now choose to drink tea if you want to! Tea Party Girl asks : Do you drink loose leaf tea?